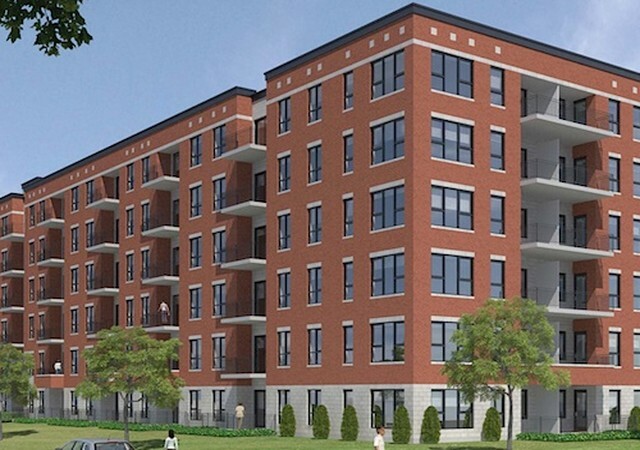 In the heart of an up-and-coming area, Phase II of this project enjoys an extraordinary location, close to amenities like Place Vertu, Les Galeries St-Laurent, Marcel-Laurin and St-Laurent parks with their numerous sports venues, Vanier CEGEP, St-Laurent CEGEP and Sacré-Coeur Hospital. Easily to access by car and public transit, Place de la Gare Bois-Franc II is both private and accessible, while offering spaciousness, natural light and vast green spaces including an indoor courtyard with a rest area. Condo owners can also use the rooftop pool and gym. Phase II consists of a 6-story concrete building (96 condos arranged according to current market trends) equipped with sprinklers, elevator and underground parking. Optional indoor parking available. Each condo has private storage area. All units have a terrace or balcony and most have a tiled shower with a glass door. Options include furnished private rooftop terraces. This project qualifies for financial assistance under the City of Montreal’s Home Ownership Program.